Recurring Dream - The Chip's Challenge Wiki - The Chip's Challenge Database that anyone can edit! Recurring Dream is the 145th level in Chip's Challenge Level Pack 3. It is one of the Secret levels in CCLP3. It was created by Madhav Shanbhag, and utilizes some concepts from his previous levels, including the puzzle from Vague Dream which figures into the CCLP3 storyline. 715 route: Grab the 3 chips in the start room, then follow the spiral, turning R at the chip. Go through the teleport, collect the blue key from the blue wall maze, collect the chip at the bottom of this maze. Open the lower blue door and push the lowest block into the water (one paramecium should drown, the other 2 will circle thin air – you may have to wait up to ). Now push the rightmost block D 3R (waiting so that one paramecium follows the block into the water). Do likewise with the next block, and step on this block. Push the final block across (reaching the room with the hint). Push the other block D to reach the blocks and dirt room. Push the first block L 3U 2R, and go round (via the teleport) to push this block U L. Use the other 2 block to bridge upwards and reach the room with the bug cloner (this resembles level 33). Uncover the dirt so that the bugs follow the wall and drown. Push a block across the teleport, follow it, collect the blue key and open the door. 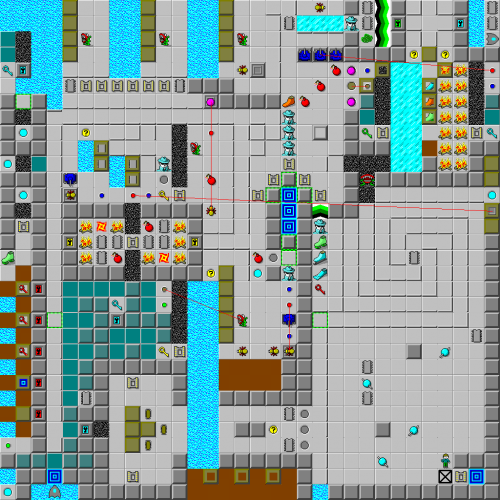 Teleport the block and push 2 more blocks through, pushing them into the water to the right of the gravel tile immediately above the blue door. Bridge to the next room (by pushing the top 2 blocks L and using the others on the fourth row). Do the same in the next room but use the second row. In the next room, push block 2 2R D, move block 3 U (by pushing block 4 into the water), then push block 2 D. Collect the chip and wait for the bug to explode the bomb. Walk across the trap (held open by the button under the block immediately to the right), collect the green key, then the fire boots and suction boots under the blocks to the right, then the blue key. It is not possible to get the chips behind the blue door as this blue key is needed later. Collect the chips behind the green door, slide back and collect the fire boots. Now collect the 2 loose blocks and move them to the left, setting up a bridge to the chip by the sockets. Return to the blue wall maze, go through the blue door, and collect the yellow key. Go round to the yellow door to the right of the fireballs and collect the chips (the fireballs should explode the bombs). In the next room, all 4 blocks have chips under them – do not fill in the lowest water tile, as one block is needed to the right. Place it to the left of the bomb (using the recessed wall), causing the bug to explode the bomb and stop cloning balls above. Press the blue button as the tank reaches an end so as to stop the tanks from reversing, then return to the ball corridor to collect the last 2 chips. Go round the top and through the sockets (do not touch the thieves), and collect the block from the centre (also collect the yellow key). On exiting this room it will be necessary to stop the tanks again. Place the block above the bomb above the teleport, then go right round to explode the bomb. Teleport, collect the suction boots and remove the dirt. Walk round the top again and go across the force floor to the right of the inaccessible exits. Collect the red key along with some boots which will be lost immediately, and go round and open the top red door to the left. This will allow the block to be pushed over the water. Uncover the dirt so that the next block can be pushed, and continue until the exit is uncovered (the first 3 blocks have red keys under them). This page was last edited on 13 March 2019, at 01:32.